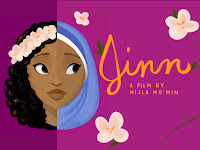 Nijla Mu’min reached her $25,000 Kickstarter crowdfunding campaign goal in early 2016 with a pledge of $27,894 by 398 backers. In this millennial coming of age dramedy, a teen girl’s life is abruptly turned upside down when her mother converts to Islam, sending her on a quest for self-definition. A fun, fresh exploration of identity, Islam, first love, and millennial culture.